To prepare students for a career in the Childcare field who are ready to enter the workforce immediately after graduation, as well as students who wish to continue their education in a post-secondary setting. Students will have an opportunity to work in a childcare setting as part of the classroom curriculum. The childcare industry is considered a bright outlook occupation that is expected to grow rapidly in the next several years, offering a large number of job openings. 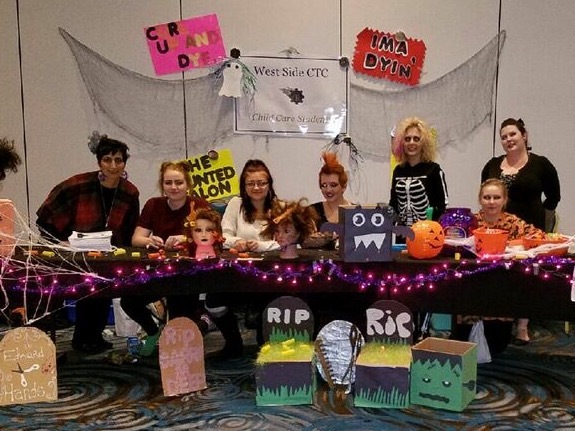 Child Care Students recently participated in WNEP's 2016 "Trail of Treats" located at Mohegan Sun Casino in Plains, Pa this event is held for children and adults with special needs and are unable to go Trick or Treating. Those participating from left to right: Mrs. Warren, Learning Support Teacher, Emily Yuhas, Brittney Washko, Amber Stoodley, Mrs. Temple, Child Care Instructor, Cheyanne Nice, and Ms. Samantha Temple, Volunteer.